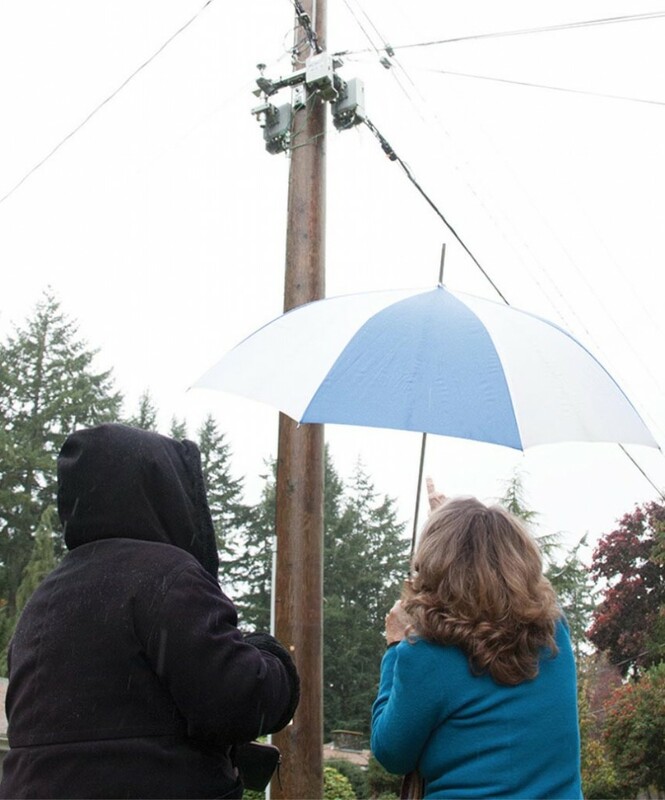 Langford resident J. Scott and Highlands resident Janis Hoffmann take a look at the cellphone transmitter that was installed near Scott’s home on Fairway Avenue. — Image Credit: Katherine Engqvist/News Gazette StaffJ Scott was on holidays when Telus Communications Company contractors installed fibre optic cables in her Langford neighbourhood. But upon her return she noticed something on a nearby utility pole that she wasn’t made aware of when representatives went door to door on her street. Micro-cell transmitters are popping up on utility poles across the province and they’re something some West Shore residents are concerned about. After realizing what they were, Scott went around her neighbourhood asking people to sign a petition to have the devices removed from poles on their street. “(Almost) everyone on our street signed the petition,” she said, noting that she was unable to catch someone home at the one household that didn’t sign. Residents on Fairway Avenue aren’t the only ones requesting that Telus move or remove the transmitters. Colwood resident Sharon Noble said, “if you’re living with this outside your home, you should be told what it is.” She said that when the fibre optic network was going up outside her home on Triangle Mountain, she asked every possible question about them. Scott added that she asked the same questions and was assured there would be no transmitters. Janis Hoffmann was successful in getting a transmitter that would have gone up outside her home moved to a different location, adding that she recognized what the workers were putting up before it was installed. She also had a note, from a doctor specializing in electromagnetic hypersensitivity (EHS), for her grandson and daughter who now live with her. New to the Highlands, Hoffmann had lived in Colwood for 43 years. “I had no intention of selling my house … I was going to live there forever,” she said. But after finding out her grandson suffers from EHS, which she said led to a number of health issues, Hoffmann said she began to realize what her home was being exposed to. With her grandson in her home most days, she looked for alternatives. After moving to the Highlands, in an area with very little exposure to cell towers and Wi-Fi, her grandson experienced major improvements to his health, she said. Asked why residents were consulted about the installation of fibre optic cables, but not the micro-cell transmitters, he said that when crews install cables they need residents’ permission to do so on private property. A City of Langford staff member said the City has no consultation policy for the installation of these types of devices, noting they cannot regulate them as they are on Telus’ property. The infrastructure is, however, regulated by the CRTC. As for why these transmitters are going up, Gilhooley said demand on the Island for better cell coverage is increasing. He nodded to the rise in 9-1-1 calls originating from cell phones. “We want to be able to keep up with demand,” he said. Alternatively, he added, without additional micro-cell transmitters or towers residents could start to see an increase in dropped calls. Vancouver, BC – TELUS, Canada’s fastest-growing national telecommunications company, and Huawei, one of the world’s largest telecommunications and ICT (information and communications technology) suppliers have achieved another significant milestone in their journey towards 5G with the successful deployment of a Heterogeneous Network (HetNet) in the heart of the 5G Living Lab in Vancouver. HetNet is one of the key building blocks for 5G and combines multiple types of cells (such as outdoor macrocells and microcells and indoor picocells) to enhance both coverage and capacity in crowded areas and inside buildings where outdoor signals do not reach. The network enables seamless transitions between cell types to ensure uninterrupted streaming of ultra-high-bandwidth applications (like high-definition video, video conferencing or cloud-based services) as devices move throughout the network. As data demands on wireless networks increase, HetNet will play a key role in providing an ultra-fast and reliable network experience, especially in dense urban environments. In addition, TELUS and Huawei have successfully enabled a C-RAN (Centralized Radio Access Network) across multiple 5G Living Lab sites in Vancouver and are now operating the largest C-RAN deployment in North America. C-RAN is a next-generation network architecture that centralizes the management of multiple cell sites, enabling intelligent allocation of radio capacity and improved network throughput in crowded urban areas or at special event locations. The deployments took place in the heart of TELUS and Huawei’s 5G Living Lab in downtown Vancouver, where both companies have been trialling next generation technologies since late last year in a live, real-world setting. While 5G is anticipated to become mainstream by 2020, TELUS customers living in the Vancouver area will benefit from these latest technological innovations right away. TELUS advancement towards 5G builds on the company’s $1-billion investment to connect Vancouver to the TELUS PureFibre network, which will ultimately provide the backbone to support lightning-fast wireless speeds as the development roadmaps for wireless and wireline networks converge around 5G. The PureFibre network will provide nearly limitless capacity to support the highly efficient, reliable and blazing-fast wireless speeds 5G will enable for customers, heightening the importance of TELUS’ fibre investments across Canada. October 11, 2016 — Canadian telecom provider TELUS and Huawei have achieved wireless speeds of nearly 30 Gbps – 200 times faster than the LTE standard in the “5G Living Lab” in Vancouver, Canada. where both companies have been trialing 5G technologies since late last year in a live, real-world setting. In other static and mobile field trials, Huawei has achieved downlink speeds of 27 Gbps using Polar Code, a 5G channel coding technology, telecomasia.net reported this week. Polar Code is designed to be several times more efficient than current RAN networks, optimizing encoding and decoding. In addition to the 5G tests, TELUS showed that it hasn’t forgotten 4G by upgrading its first site to LTE-Advanced Pro, which is capable of up to 1 Gbps –10 times faster than current LTE-Advanced speeds. Five more sites will be upgraded in the coming weeks. LTE-Advanced Pro compatible devices will become available early as next year. Huawei and TELUS announced the achievement of wireless speeds of 29.3 Gbps. The results, 200 times the current LTE standard, were obtained during trials of 5G mobile technology at the TELUS and Huawei 5G Living Lab in Vancouver. Solidifying the 5G base to meet the needs of IoT and intelligent devices, both companies were involved in trials since last year in a live, real-world setting. TELUS customers in the Vancouver region will get early access to the newly emerging wireless technologies in the world, ahead of the 5G services, expected to be on air by 2020. Also, a 4G LTE wireless site in Vancouver has also been upgraded with the latest advancement in LTE-Advanced Pro technologies with speeds of up to 1 Gbps, which is 10 times faster the current LTE-advanced speeds. TELUS also added that five more similar sites will be upgraded in the coming weeks. TELUS is planning to make the latest technologies available as early as next year with LTE-Advanced Pro compatible devices being available by then. TELUS previously announced a $1 billion investment to connect Vancouver to the TELUS PureFibre network. This will provide a foundation to upcoming high speed wireless and wireline networks. The PureFibre network will also provide enhanced capacity for wireless 5G speeds hiking TELUS fibre investments across Canada. TELUS saw a revenue growth of 1.5 percent or $3.1-billion in the previous quarter. TELUS also added that its wireless network revenue increased by 2.6 percent to $1.6 billion owing to subscriber growth, increased customer spending on mobile data and expensive monthly plans. Also, the total capital expenditure in 2016 was raised by $200 million to $2.85 billion, owing to major investments in copper wire network upgradation to fibre-optic technology. The Seventh Annual Mobile Broadband (MBB) Forum will be held in Tokyo, Japan on November 23 to 25, 2016, where both companies will discuss and present major developments in the area. Bell Canada, a network partner of TELUS, also recently announced a successful 5G trial with Nokia for spectrum across the 73 GHz band. In the meantime, Verizon, AT&T, T-Mobile and Sprint have also announced similar efforts underway for developments in 5G. Huawei announced it has achieved downlink speeds of 27Gbps using Polar Code, a new innovation in 5G channel coding technology. During a field trial in both static and mobile environments, Huawei was able to demonstrate that polar code technology can simultaneously meet the typical use cases of the ITU’s 5G definition, which involves speeds in the tens of gigabits, 1ms latency and billions of connections. The company said polar code demonstrated three times the spectrum efficiency compared to current RAN networks. Polar code is designed to allow significantly higher spectrum efficiency than current cellular access technologies and to enable decoding with linear complexity. On the encoding side, polar code can optimize channel capacity close to the Shannon Limit, the theoretical highest capacity of a communications channel before noise introduces faults. The field trial also took into account the use of millimeter-wave and multiple parallel sessions based on short and large packet sizes. Could the 5G Future Pose a Health Risk? Super-fast 5G wireless is still years away from widespread commercial service but researchers are already wondering if the new networks — which will feature many more radios than previous cellular architectures deployed very densely in towns and cities — could pose a health risk to the general public. Massey University in New Zealand has announced this week that it got funding to investigate if there will be any adverse effects of electromagnetic radiation to human health caused by the next generation of telecommunication networks called 5G. The research will take place through 2017. “With some industry giants predicting 50 billion connected devices by 2020 and with the employment of much higher transmission frequencies proposed for the 5G rollout, it is essential to determine how the future of telecommunications will affect the health of its users,” principal investigator Dr. Faraz Hasan says in the announcement. There’s a further wrinkle to the 5G radios that it is not even clear from the announcement whether this research will grapple with or not. The FCC, for instance, keeps very tight limits on the antenna power limits allowed for different fixed and mobile applications. Carriers in the US, however, are starting to ask the agency if they can increase the amount of Effective Isotropic Radiated Power (EIRP) — that’s peak antenna gain — used for millimetre wave applications. Verizon Communications Inc. (NYSE: VZ) said this in a filing to the FCC in January this year.‘Conventional’ base station antenna gains for other mobile uses typically have gains in the 9–25dBi range because they are limited by practical antenna size. In mmW bands, however, gains from 20–45 dBi can be achieved depending upon beamwidths desired.A base station power limit of between 68 and 75 dBm EIRP is thus more appropriate for these higher frequency bands than the 62 dBm EIRP maximum proposed based on the properties of other spectrum. So there you go, gentle reader, we don’t think you’ll be accidentally sterilized by the super-high power radio waves of the 5G future but we don’t yet fully know what effect incredibly dense mmWave radio networks pumping out really hot signals might have! Maybe don’t throw out that tin foil hat just yet. The FCC is moving quickly to make good on its promise to ease small-cell deployments. Wireless carriers are increasingly looking to small cells and distributed antenna systems to increase both coverage and capacity as data consumption ramps up and as they prepare for the emergence of 5G. But rollouts have been slowed as municipalities, property owners and local organizations struggle to develop policies to manage them. Montgomery County, Maryland, has around 200 pending applications for small-cell installations, Inside Towers recently reported, for example. And a request by Mobilitie for relief from “excessive charges” for access to public rights-of-way resulted in nearly 130 comments to the FCC. The FCC hopes to help address those problems to make it easier and less expensive to deploy the smaller transmitters. The FCC finalized rules in August aimed at addressing siting concerns in a move cheered by players across the industry, but CTIA and others claim adoption of the proposals in the Small Cell Public Notice will streamline local processes. During its next open meeting, which is slated for April 20, the agency will vote on launching an examination of the “regulatory impediments” that are weighing down small cells and other kinds of infrastructure. Wireless carriers for months have urged the FCC to get involved to help ease small cell deployments. A top CTIA executive met with FCC officials last week to continue to push for streamlined policies for deploying small cells. “CTIA encouraged the Commission to adopt the proposals in its recently-released Small Cell Public Notice that would streamline local review of wireless infrastructure applications, clarify actions that prohibit or have the effect of prohibiting wireless service, and ensure that compensation for use of public rights of way is cost-based, fair, and reasonable,” the trade association said in an FCC filing. TELUS and Huawei announced the deployment of a Heterogeneous Network (HetNet) in the heart of the 5G Living Lab in Vancouver, Canada. Telecoms are making investment in HetNet, one of the key building blocks for 5G that will become a reality by 2020. HetNet technology combines multiple types of cells such as outdoor macrocells and microcells and indoor picocells to enhance both coverage and capacity in crowded areas and inside buildings. The HetNet network enables seamless transitions between cell types to ensure uninterrupted streaming of ultra-high-bandwidth applications like high-definition video, video conferencing or cloud-based services as devices move throughout the network. Meanwhile, Ericsson Mobility Report forecasts 550 million 5G subscriptions in 2022. North America will lead the way in uptake of 5G subscriptions, where a quarter of all mobile subscriptions are forecast to be for 5G in 2022. In addition, TELUS and Huawei have enabled a C-RAN (Centralized Radio Access Network) across multiple 5G Living Lab sites in Vancouver and are now operating the largest C-RAN deployment in North America. C-RAN network architecture centralizes the management of multiple cell sites, enabling intelligent allocation of radio capacity and improved network throughput in crowded urban areas or at special event locations. TELUS and Huawei have been trialling technologies since late last year in a live, real-world setting – at 5G Living Lab in Vancouver. While 5G is expected to be available by 2020, TELUS customers in Vancouver will benefit from these latest technological innovations right away. 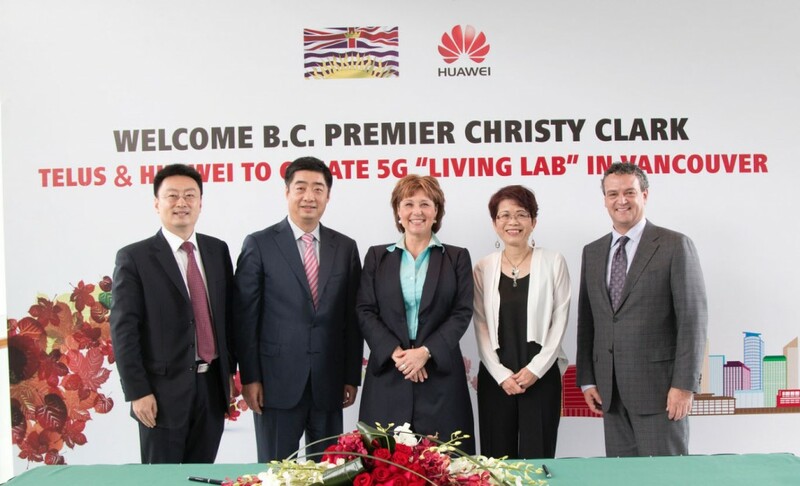 “Through our joint efforts in the 5G Living Lab, we are ensuring Vancouver and Canada are at the forefront of deploying the technologies that will bring 5G to life in the years ahead,” said Sean Yang, president of Huawei Canada. Earlier, TELUS announced $1 billion investment to connect Vancouver to TELUS PureFibre network. TELUS with $12.7 billion of annual revenue has 12.6 million subscriber connections, including 8.5 million wireless subscribers, 1.6 million high-speed Internet subscribers, 1.4 million residential network access lines and more than 1.0 million TELUS TV customers. Telus and Huawei have announced two new technology deployments that will help make progress towards 5G wireless networks. The first technology is the deployment of a heterogeneous network (HetNet) in Vancouver.A heterogeneous network is a wireless network comprised of various different technologies that are put together in order to provide better coverage in crowded areas. The launch of HetNet in Vancouver was made successful because of a partnership with Vancouver-based 5G Living Lab. The second technology is a Centralized Radio Access Network (C-RAN) that was deployed in Vancouver. C-RAN is a network architecture that allows companies to centralize the management of multiple cell sites. Telus customers in Vancouver will be able to enjoy the benefits of these new technologies right away. Customers living in other locations will have to wait until 2020 when 5G becomes mainstream. One Canadian company, however, may single-handedly make small cells mainstream across the country — or at least in the western half of the country. Shaw Communications, which in 2011 reversed course on its decision to deploy a cellular network after spending $189.5 million in 2008’s AWS spectrum auction, currently operates some 75,000 WiFi hotspots across Western Canada and parts of Saskatchewan, Manitoba and western Ontario. While Shaw has yet to comment on its plans for Wind Mobile (Freedom Mobile), which it is purchasing for $1.6 billion, one obvious measure to shore up signal is to augment its existing WiFi infrastructure with a network of small cells broadcasting what will inevitably be high-speed LTE through those existing nodes. Shaw expects to spend $250 million throughout this year and into 2017 to improve Wind’s network, eventually rolling out a robust LTE network once handsets are available that support the just-ratified AWS-3 standard. Strangely enough while Canadian carriers continue to struggle to fill the connectivity gaps throughout sparsely populate rural areas of the country; they are at the same time struggling to patch the network holes in densely populated urban centres as well. The problem with the latter has always been that in dense cities wireless signals struggle to flow freely through the concrete jungle, meaning certain users may be hard-pressed to find wireless connectivity in their homes or offices, or even in certain parts of their homes or offices. In an effort to fill such dead zones in network coverage, giving everyone the best wireless experience possible, Canadian carriers are turning to a solution we’ve seen bandied about for several years now: small cell technology. 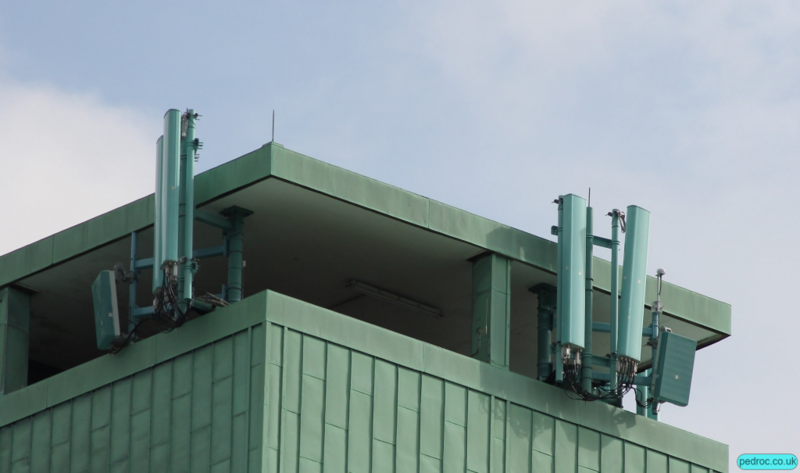 By installing these diminutive, short-range devices as strategic points throughout densely populated urban centres, carriers will be able to better establish comprehensive coverage, as the cells will work in conjunction (sometimes even replacing) with the larger, “macro” cell tower infrastructure that we commonly associate with wireless networks. While all major Canadian carriers do utilize small cell technology already, look for 2016 to be the year where this technology comes to the fore, as carriers look for ways of providing the ubiquitous technology our increasingly connected everything existence demands. Now I would argue that for the more part Canadians don’t care about the technology used to create reliable and accessible network coverage, they just want to know that when they need to connect, the connection is strong and fast. But as I said, the problems in Canada are that carriers either have to foot the bill for providing network coverage over expansive and sparsely populated rural communities, or they have to find ways of penetrating the alternatively dense concrete jungle of the country’s huge metropolitan centres. It is the latter where small cells will likely play a growing role this coming year. As mentioned, small cells work both to bolster and bandage nationwide 3G/4G/LTE networks, increasing network coverage in areas were traditional coverage has been weak, working alongside traditional cell towers, even replacing them when required. With a range between a few metres and a few kilometres, by installing small cells in key locations, such as buildings, lamp posts, or busy outdoor spaces like parks, Canadian carriers will be able to broaden their blanket coverage, allowing their respective networks to handle more devices at once, thus allowing more people to connect to wireless networks using smartphones, tablets, and other wireless technology. While not a new technology per se—and one rife with unresolved security concerns—small cells are one key piece to the spectrum puzzle, as carriers look for ways to expand their network coverage and better utilize the bandwidth they have available. According to reports, in 2015 Telus deployed more than 2000 small cells around Vancouver and Calgary, surpassing Rogers and Bell estimates of around 500 cells respectively. While no carrier has officially acknowledged their small cell deployment numbers, they do seem to be on the rise, if for no other reason than newly arrived competitor Shaw—who recently completed its takeover of WIND Mobile, after which the entire company was purchased by the Corus Entertainment group—already has extensive Wi-Fi hotspot infrastructure in place, at least in Western Canada, which could easily be redeployed as small cell network support to help differentiate the company from its incumbent competitors. All that to say, there’s no question that small cells are useful for carriers to effectively utilize their spectrum resources, allowing those carriers to close connectivity gaps in dense urban jungles, and it seems that 2016 will only see further growth of this technology, particularly as part of the groundwork for forthcoming 5G wireless technology and the growing Internet of Things. “More than 10 years ago, some AT&T Labs engineers worked on earlier experiments to deliver BPL (broadband over power lines). Back then, broadband merely meant megabit speeds. The technology worked well, but couldn’t keep up with the move to higher speeds. 5G may be the ultimate winner of Project AirGig, the AT&T-led initiative that uses power lines to deliver superfast internet service. Although AT&T doesn’t yet have plans to commercially deploy AirGig, the company is planning on more trials this year that will involve 5G. 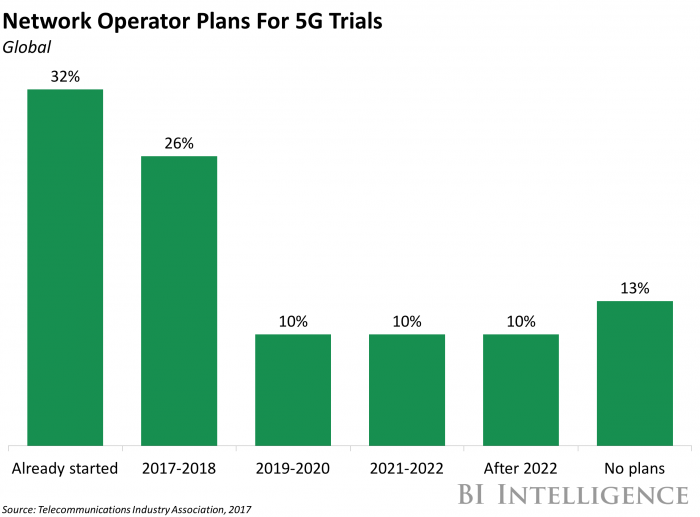 AT&T is also currently working with vendors and technology partners to build commercial-grade 5G equipment for those trials. According to Hank Kafka, vice president of access architecture and standards at AT&T, the company isn’t ready to provide details about those vendors or the upcoming trials. However, he did say Project AirGig is making progress, and the operator believes it will be a very complementary technology to 5G. Kafka said that while AirGig can support a range of different wireless transport technologies including LTE and 5G, he noted that “5G is very high on that list.” Specifically, AirGig could be used to extend 5G millimeter wave (mmWave) signals beyond their current range. AT&T has launched mobile 5G service in 19 markets so far using mmWave spectrum, but using that spectrum has drawbacks because it has a limited range compared to lower spectrum bands. AirGig technology includes a radio distributed antenna system (RDAS) and mmWave surface wave launcher. The RDAS reconstructs signals for multigigabit mobile and fixed deployments, while the mmWave surface wave launchers can power themselves using inductive power devices without an electrical connection. These devices then create a high-speed signal that travels along or near the wire, providing a broadband connection. 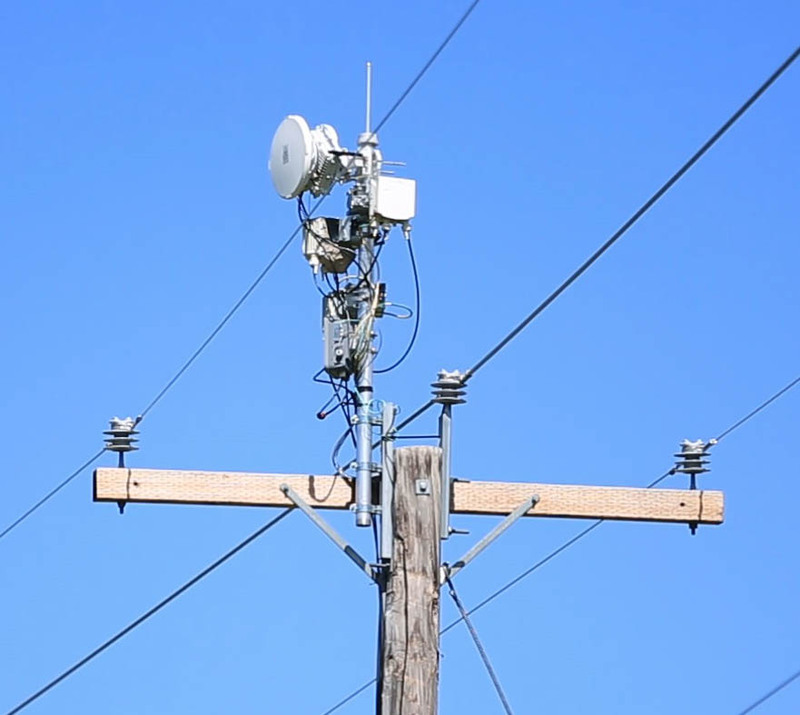 In 2017, AT&T tested AirGig in a trial with Georgia Power Company but used LTE as the transport technology. Kafka said that it used LTE because there wasn’t any 5G equipment available that was appropriate for the trial. “At the time of the trial 5G equipment was large and bulky,” he said. But now 5G is commercially deployed in some markets, and more streamlined gear is available. That’s why AT&T is now working with vendors to get the right type of gear for the new trials. Nevertheless, the operator believes that early trial with Georgia Power was a success because it showed that the technology was able to transmit a signal regardless of weather or any other issues. And Kafka said that the company also had a good response to its self-install receivers. “Within 10 minutes, customers could get the receiver installed and get access,” he noted. Because AirGig is still in the development phase, Kafka said that AT&T is not currently negotiating any deals with utility companies to deploy the technology on their power lines. However, he did note that AirGig might be a natural technology to support smart grid applications, and that might be appealing to utilities. He also said that commercialized AirGig would be a good fit for small cells because of the way it is architected. In other words, a wireless signal could travel down the power line and hand off to small cells or be used to backhaul wireless traffic from small cells. DALLAS, Feb. 12 (UPI) — AT&T said Friday it intends to start testing next-generation 5G technology next month with faster speeds coming first to Austin, Texas. The company unveiled plans to upgrade its wireless systems to the faster technology by the end of 2018, saying it expects to provide its current 46 million subscriber base with 10 to 100 times faster data and web connections. Testing of the 5G systems is expected to take about a year to debug, with another year planned for getting hardware in place across the United States and switching customers over to the updated spectrums. AT&T says consumers will see the biggest change in how download and upload speeds are measured. They are are currently calculated in megabits, but after the switch they will be conveyed in gigabits. The company says that at 1 gigabit per second, customers can download a 30-minute TV program in less than 3 seconds. AT&T will work with fellow technology companies Ericsson and Intel to start rolling out trial runs of the new hardware and software in the next few months. AT&T is the second-largest wireless and data provider in the United States. It’s main competitor, Verizon Wireless, in December announced a similar rollout of its 5G competitor technology.